In light of the release of the official Stack Exchange app, which has far more functionality, there seems little point in releasing further updates for StackAnywhere. I've made the ad-free version free to download, which may be of interest to people on Android 2.x who can't run the official app but everybody else should probably move to the new app. I'm open to releasing the code as open source if there is any interest. While the code isn't hideous, it is 3 years old and as such is not really a good example of modern Android development (e.g. it doesn't yet use fragments and it has a home-brew version of loaders that might have made sense at the time but doesn't now). 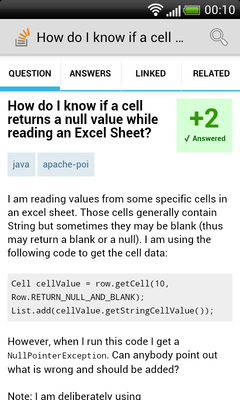 Long overdue update for Android 4.x and version 2.x of the StackExchange API (updated screenshots below). This version is mostly to get things on a better footing to move forward. Scope creep. 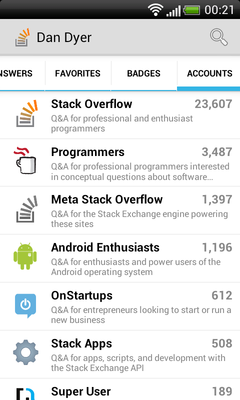 I never set out to write a full Android Stack Exchange client. It started out as a widget for the phone's home screen with notifications for when new answers were received. But then it really needed a better way of viewing the questions than just redirecting to the website. And then it didn't make sense to only be able to view questions that you'd received notifications for, so I added a user viewer so that you could view all of your questions. I left it for a while and then came back to it again recently to tie everything together. Because of these origins, the app is still somewhat widget-centric. To get the best out of it you should install one or more widgets on your phone's home screen (you'll need your numeric user ID from the appropriate SE site - I'll see if I can do something slicker in a later version). The widget looks something like below. Tapping on the widget will take you to the user view (from which the above two screenshots are taken). 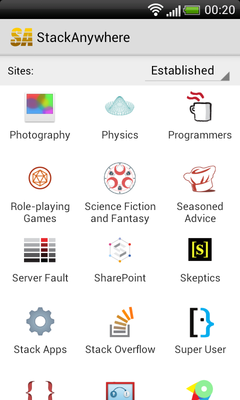 The alternative route into the app is from the launcher, which will start the network view, showing a grid of all the available SE sites, which you can then browse (questions, tags and users). There is integrated search (press the search key on the phone or select search from the menu). The search is quite basic in terms of matching because it uses the Stack Exchange API search method (I'm looking into something a little more sophisticated for a subsequent version). One thing that is pretty pointless but still neat is that you can do voice search. The first time I tried this it worked flawlessly. The second time I searched for "pass by reference" and it returned results for "frostbite restaurants", which Stack Overflow knows surprisingly little about. Maybe it works better if you have an American accent. Closed source, free to use (now ad-free). I'm open to making the code open source if there is any interest. Home Page (including more screenshots and FAQ). Download the free, ad-supported Silver Edition from Google Play Store. Download the ad-free Gold Edition from Google Play Store. Me at Rectangular Software. Use the contact form or e-mail android at the same domain. Alternatively, just respond here. 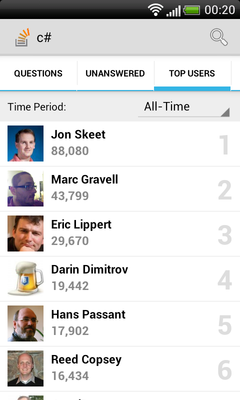 Written in Java for Android using IntelliJ IDEA and Apache Ant. Third-party libraries are Jackson (for JSON), StringTemplate for building the HTML content, and the AdMob SDK. Browse other questions tagged app android obsolete notifier widget .